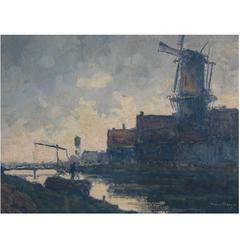 Windmill and a figure in moonligh, Normandy, France Signed and dated lower right: G. Ames Aldrich / 1908 Measure: Canvas: 24" H x 30" W Framed: 31" H x 37.5" W x 2.5" D. George Ames Aldrich, American (1872-1941) In this scene, Aldrich masterfully denotes moonlight upon a windmill and female figure on a flowing river at night. The woman with lantern in front of a backlit door have lights reflect on the flowing river below. 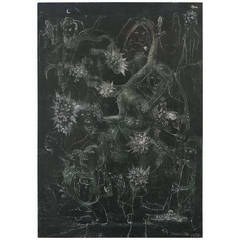 This painting was an earlier Aldrich work done in Normandy France. An exceptional Art Nouveau - Art Deco painting. In the Beaux Arts and Impressionist manner. Condition is wonderful. The painting has been cleaned, masterfully and minimally touched up to last several lifetimes of enjoyment. Relined and stabilized. New frame. Museum condition. George Ames Aldrich was born in Worcester, Massachusetts. He studied art at the Art Students League, MIT, and in Paris at the Academie Julien, and Colarossi Academy. Aldrich became a successful and respected etcher and painter. His studies in architecture at MIT is reflected in the buildings and houses in many of his landscapes paintings. Aldrich painted extensively in Europe early on in his career and in later visits. In 1918, Aldrich arrived in Chicago and became involved with the South Bend, IN art scene during the 1920s. Aldrich travelled and painted widely in the 1920s, going both West to the Great Plains and east to various New England coastal locales. Aldrich exhibited regularly at the Art Institute of Chicago, and was a member of the Chicago Galleries Association, the Hoosier Salon, and the Chicago Society of Painters and Sculptors. Both in Indiana and in Chicago, Aldrich's reputation was at its height in the late 1920s and early 1930s. He won a host of awards at the Hoosier Salon, the Art Institute, and the Chicago Galleries Association, where he was featured in a solo show in 1927. The following year, the City of Chicago purchased one of his large Gloucester, Massachusetts, harbour scenes for its municipal art collection. George Ames Aldrich's work is represented in many museums throughout the world, including the Museum of Fine Arts, Boston, Purdue University, the Musee de Rouen, France, as well as the Union League of Chicago and the War Mothers Building in Washington, DC. Large original painting of a woman carrying two martini glasses by Lee Ames. This painting is on a board. Great item for a collector. 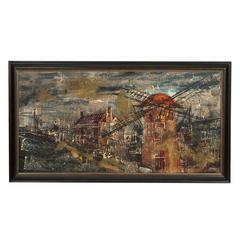 Newly framed vintage oil painting of a windmill by French artist Dominique Sfax.